A San Diego native, Katie grew up training primarily in ballet. She also trained in flamenco, jazz, and tap and her first tap teacher was Pam Thompson-Spinner, founder of CRP. Katie currently performs and choreographs with Mesa College and is a member of Mojalet Dance Collective. Between rehearsals, working at theNAT, and teaching Red Cross life response, she enjoys being with her corgis, outdoor rock climbing and social partner dancing. Nancy Boskin-Mullen's career as a professional dancer and choreographer has spanned three decades and three continents. She holds a B.A. in World Arts and Cultures with a concentration in dance, and an M.A. in Dance from UCLA. She currently teaches dance at Grossmont College and Mesa College. She has danced with California Rhythm Project since 1998 and became company director in 2012. Summer earned a B.A. in Dance at SDSU and a Masters in Education and Teaching Credential from National University. She has danced with Pro Danza Italia, Debbie Allen Dance Academy, Momentum Dance Theater and Capital Tap, and has performed for DC Tap Festival, and Sony Production's Taylor Swift Commercial. She is the owner of Rap A Tap Center For The Arts, a dance studio located in the city of San Diego, and also teaches dance at Creative, Performing and Media Arts Magnet Middle School. Born and raised in San Diego, Sara began dancing as a child. She continued her dance training at the University of California San Diego where she earned a BA in Dance, her teaching credential and Masters in Education. She currently teaches dance at Creative, Performing and Media Arts Magnet Middle School where she has built a dance program focusing on tap, jazz, and ballet. Sara loves to share her passion for dance with others. Shary started dancing as a child, often performing at local festivals with a small tap troupe. During high school and college, she danced in community theater productions and she was a member of the Dance Ensemble at the University of Houston. While teaching English abroad, she performed with Jenesko's Tap Dance in northern France. She is delighted to be a part of California Rhythm Project. Mary Jo has directed and choreographed over 40 dance concerts at Southwestern College since 1990. She received her B.A and M.F.A. in Dance from UC Irvine where she studied with Eugene Loring, Jillana, Donald Bradburn, El Gabriel, Olga Maynard, James Penrod, Janice Plastino and Nancy Ruyter. She has also studied under Jean Isaacs, Billy Siegenfeld and Jeannie Hill, Diane Walker, Linda Sohl-Ellison and Ted Levy. She has danced professionally with Nannette Brodie Dance Theatre and the California Rhythm Project. Veronica has been dancing most of her life. Although trained in many different forms of dance, tap has always been her main passion. Growing up in San Francisco, she was introduced to different forms of tap by masters such as Sam Weber, John Kloss and Kathe Burick. 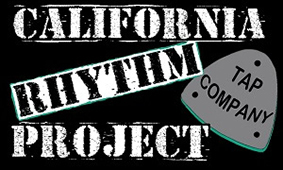 She found her home when she was introduced to California Rhythm Project in 2009. Kyra was 7 years old when she started taking dance classes, learning technique in Tap, Jazz, Ballet, Hip-Hop, Polynesian, Tahitian, Contemporary, and Modern at MYSTIC Dance San Diego Studio. In the years since, she has performed on television and in countless competitions and workshops throughout San Diego, Los Angeles, and Las Vegas. She has been dancing with California Rhythm project since 2017. Josh began his dance career in high school when a studio owner offered free jazz dance lessons to his football team. His love of dance flourished and by his senior year he was helping teach tap classes to pay for additional classes in ballet, jazz and tap. He continued exploring the world of dance in college and at age 18 was offered a student teaching position in the tap dance program at Brigham Young University. He has taught tap classes in Utah, Nevada, Colorado, California and Brazil. Currently he splits his free time between his two horses, clogging with the Kickers Cloggers and California Rhythm Project. Tap is Vincent's first love, which he is delighted to share with others. He has studied multiple styles of dance, especially ballet and tap. Beginning at 4 years old, he studied at Civic Dance Arts, graduated from San Diego SCPA, and then completed a "normal" degree at University of San Diego. For five seasons he has been a Corps de Ballet member of California Ballet Company, and continues to perform in The Nutcracker and other ballets. Mikah has been dancing since she was 2 years old. She studied ballet, tap, jazz, lyrical, and character at Ramona/Julian Academy of Dance. She went on to compete and perform with the Academy and she also performed in Ramona High School's dance productions. Now an instructor at Ramona/Julian Academy of Dance, she teaches Pre-school Creative Movement, Beginning Tap, and Competitive Dance. She is also studying at Grossmont College and working towards a BA in Liberal Studies to pursue a career in teaching and she is a member of the 2019 Grossmont College Touring Dance Company. Cari began dancing in kindergarten and she hasn't stopped since. She has studied jazz, ballet, modern and tap. She currently teaches math and works with dance and musical theater groups at Clairemont High School. Jenn is a choreographer, performer and teaching artist. She began her training in San Diego, California and has traveled throughout the US pursuing an education in performing arts. Her stage experience includes dance, theatre, fashion and trade shows. She is an Aubrey Award winning choreographer and has been highly recognized for her choreographic work in the San Diego and Los Angeles area. She is the owner of Infinity Dance Arts and she takes much pride in sharing her knowledge and love of performing with others. She has attended Dance Masters of America Teacher Training School in Buffalo, NY where she received her teaching certification in Tap and Jazz.